The days when we were concerned—or at least, I was, being an earnest teenager in a Clash T-shirt—about Starbucks putting local coffee shops out of business seem so quaint and far away now, curled up in a cozy sweater knit in a Vietnamese sweatshop reading articles on an iPhone about how the carnauba wax and animal gelatin in Haribo gummy candies are extracted by underpaid Brazilian workers and from pigs caked in their own feces. Oh, you hadn’t heard about Haribo gummies? Let us ruin those for you as well, then. Meanwhile, back in Germany, the factory farms where the animal gelatin in the candies is sourced from pig skin are similarly deplorable. English-language German news source Deutsche Welle describes footage from animal-rights activists included in the documentary that “showed pigs with open sores and abscesses living in indoor pens in their own excrement, and in some cases among their own dead.” In response, the companies in the supply chain that eventually comes around to delicious gummy bears, meat producer Westfleisch and gelatin producer Gelita, say they were “not aware” of any violations of German anti-cruelty law and that measures for “species appropriate animal farming” were in place at the farms. 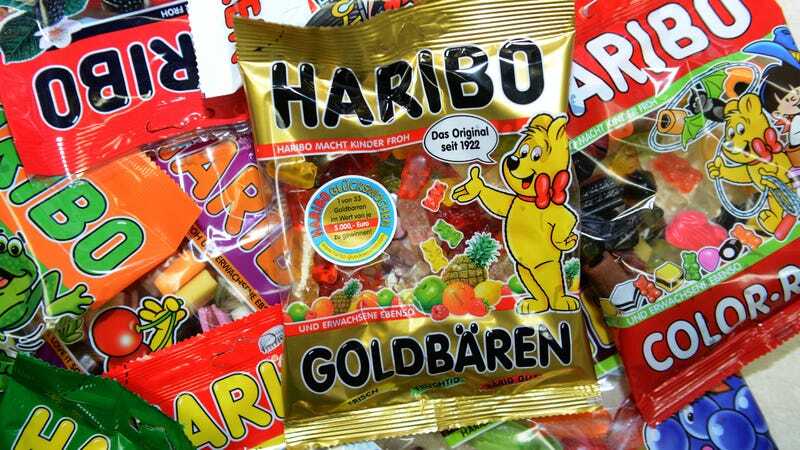 If you speak German and/or feel the urge to create a free-form visual association between gummy bears and footage of factory farming, the ARD documentary is embedded below.